Watch ATP World Tour Uncovered as Andy Murray makes his comeback after an 11-month injury absence. Hear from Murray and fellow ATP World Tour stars about his return, in front of home fans, at The Fever-Tree Championships. Remember the 2018 Fever-Tree Championships, where Marin Cilic beat Novak Djokovic in an epic final, and Andy Murray made his return after nearly a year away. Relive the best moments from the 2018 Fever-Tree Championships, held at The Queen's Club, London. The ATP tour has fined Nick Kyrgios 15,000 euros ($17,500) for inappropriate behavior during the Queen's Club tournament. 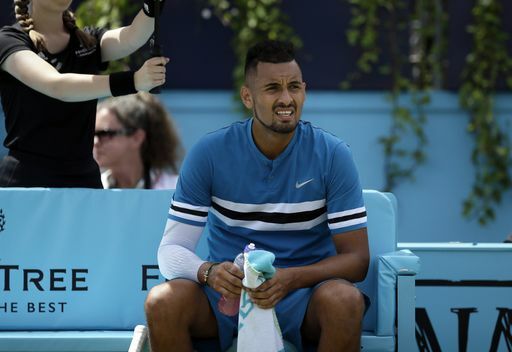 Kyrgios was caught on camera performing an imitation of a lewd act as he sat in a courtside chair at the change of ends during his semifinal loss to Marin Cilic on Saturday. During an earlier win at the same tournament over Kyle Edmund, British broadcaster BBC apologized to viewers after a string of expletives by Kyrgios were audible on air. The 23-year-old Kyrgios has won four titles on the ATP Tour and is widely considered to be a talented and temperamental player, but has a history of sanctions for his behavior on and off the court. Marin Cilic saved a match point before edging past Novak Djokovic 5-7 7-6(4) 6-3 to win his second Queen's Club Championships crown on Sunday. The Croatian, who last won the title in 2012, controlled the early exchanges from the baseline but missed six break point chances in the opening set, allowing Djokovic to battle back. The 31-year-old Serb took his chances with a couple of crisp forehands in the 12th game to break the Cilic serve and claim the first set after an hour long battle. A rampant Djokovic conceded just one point on his first serve during the second set and looked favorite to close out the contest and claim a first title for 12 months. 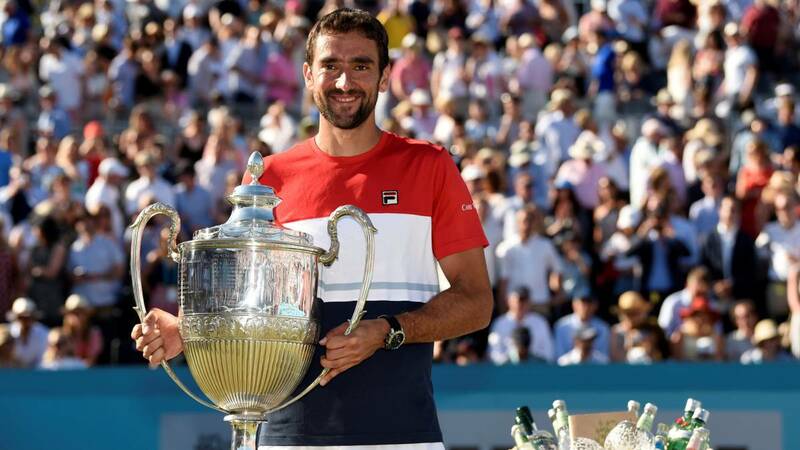 Watch highlights as Marin Cilic comes back to defeat Novak Djokovic and lift his second Fever-Tree Championships trophy. Photo Credit: Marc Atkins/Getty Images. Watch Marin Cilic discuss his second title win at the Fever-Tree Championships after defeating Novak Djokovic on Sunday. Watch Marin Cilic rip a forehand down the line past Novak Djokovic to earn his eighth break point of the Fever-Tree Championships final. Photo Credit: Patrik Lundin/Getty Images for LTA. Watch as Marin Cilic floors Novak Djokovic with a cross-court forehand passing shot, before charging to net and sending the former World No. 1 the wrong way during their Fever-Tree Championships final encounter. Watch highlights as Novak Djokovic battles past Jeremy Chardy to reach his second Fever-Tree Championships final, where he will face top-seeded Marin Cilic. Watch Novak Djokovic discuss his semi-final victory against Jeremy Chardy at the Fever-Tree Championships on Saturday. Watch as Novak Djokovic claims Hot Shot honours at the Fever-Tree Championships on Saturday, en route to booking his spot in the final. Photo credit: Ben Stansall/AFP/Getty Images. Watch as Jeremy Chardy runs around his backhand to fire a forehand into the corner and past Novak Djokovic in their semi-final clash at the Fever-Tree Championships. Watch as Marin Cilic discusses reaching his fourth Fever-Tree Championships final after defeating Nick Kyrgios in straight sets on Saturday. Watch Jeremy Chardy discuss his quarter-final victory at the Fever-Tree Championships against Frances Tiafoe on Friday. Watch highlights as Novak Djokovic battles past Frenchman Adrian Mannarino to earn a spot in the Fever-Tree Championships semi-finals, where he will face Jeremy Chardy. Marin Cilic and Nick Kyrgios also advanced to the final four on Friday. Photo Credit: Matthew Stockman/Getty Images. Watch as Novak Djokovic discusses earning his 800th ATP World Tour win after defeating Adrian Mannarino at the Fever-Tree Championships on Friday. Novak Djokovic and his peers weigh in on his astonishing 800th ATP World Tour match win following his victory over Adrian Mannarino at the Fever-Tree Championships on Friday. Watch as Nick Kyrgios breaks down his performance against Feliciano Lopez at Queen's Club, and why his serve is one aspect he has improved upon. Watch as Marin Cilic breaks down how he managed his way past a difficult test in Sam Querrey, and how he plans to reach the Fever-Tree Championships final for the fourth time.